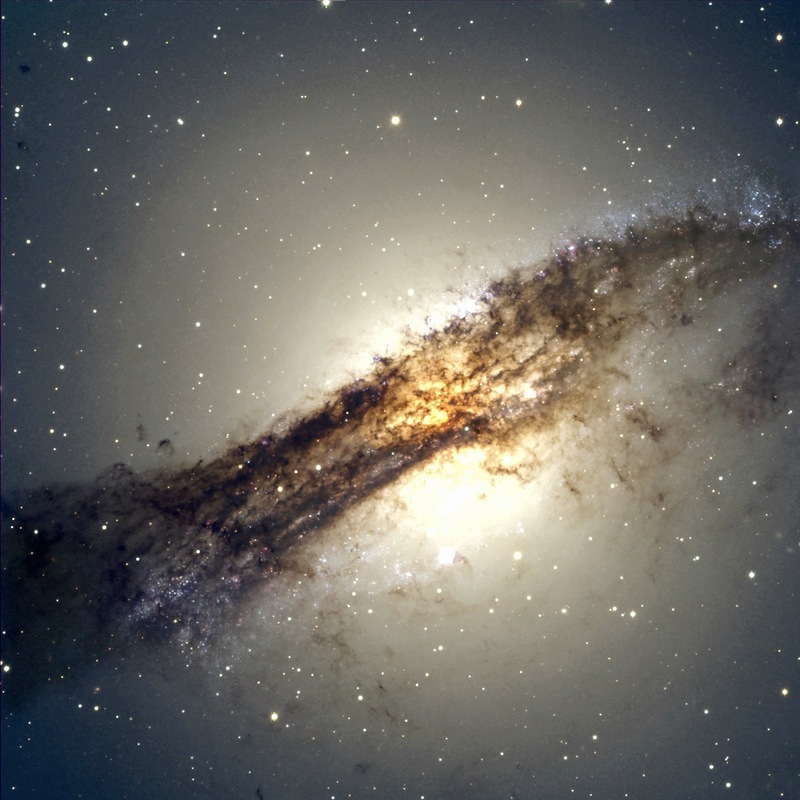 The FORS2 image of Centaurus A, also known as NGC 5128, is an example of how frontier science can be combined with esthetic aspects. This galaxy is a most interesting object for the present attempts to understand active galaxies. It is being investigated by means of observations in all spectral regions, from radio via infrared and optical wavelengths to X- and gamma-rays. It is one of the most extensively studied objects in the southern sky. FORS2, with its large field-of-view and excellent optical resolution, makes it possible to study the global context of the active region in Centaurus A in great detail. Note for instance the great number of massive and luminous blue stars that are well resolved individually, in the upper right and lower left in ESO Press Photo eso0005b. Centaurus A is one of the foremost examples of a radio-loud active galactic nucleus (AGN). On images obtained at optical wavelengths, thick dust layers almost completely obscure the galaxy's centre. This structure was first reported by Sir John Herschel in 1847. Until 1949, NGC 5128 was thought to be a strange object in the Milky Way, but it was then identified as a powerful radio galaxy and designated Centaurus A. The distance is about 10-13 million light-years (3-4 Mpc) and the apparent visual magnitude is about 8, or 5 times too faint to be seen with the unaided eye.There is strong evidence that Centaurus A is a merger of an elliptical with a spiral galaxy, since elliptical galaxies would not have had enough dust and gas to form the young, blue stars seen along the edges of the dust lane. The core of Centaurus A is the smallest known extragalactic radio source, only 10 light-days across. A jet of high-energy particles from this centre is observed in radio and X-ray images. The core probably contains a supermassive black hole with a mass of about 100 million solar masses. This image is a composite of three exposures in B (300 sec exposure, image quality 0.60 arcsec; here rendered in blue colour), V (240 sec, 0.60 arcsec; green) and R (240 sec, 0.55 arcsec; red). The full-resolution version of this photo retains the original pixels.